The Airport Metro Express Line has two stations in the vicinity of Delhi Airport: Delhi AeroCity (the airport's new hospitality precinct) and international Terminal 3. The station at Terminal 3 is an underground station that's connected to the terminal building. After clearing customs, you'll see signs in the arrivals area pointing to it. A lift will take you down to the level where the station is. It's within short walking distance, and you can carry your luggage there on a trolley. The airport's recently refurbished domestic Terminal 2 (which handles all Go Air flights, and some IndiGo and Spice Jet flights) also has access to the Terminal 3 station. It's possible to walk between the two terminals in about five minutes. Domestic Terminal 1 (which handles some IndiGo and Spice Jet flights) is now connected to the Delhi Metro train but on the Magenta Line. This line is NOT part of the Delhi Metro Airport Express Line and doesn't have the same facilities. In addition, baggage limits apply. (The Magenta Line runs from Janakpuri West to Botanical Garden. People who are staying in South Delhi may find this train line useful. Key stations are Vasant Vihar, RK Puram, Hauz Khas, Panchsheel Park and Greater Kailash). 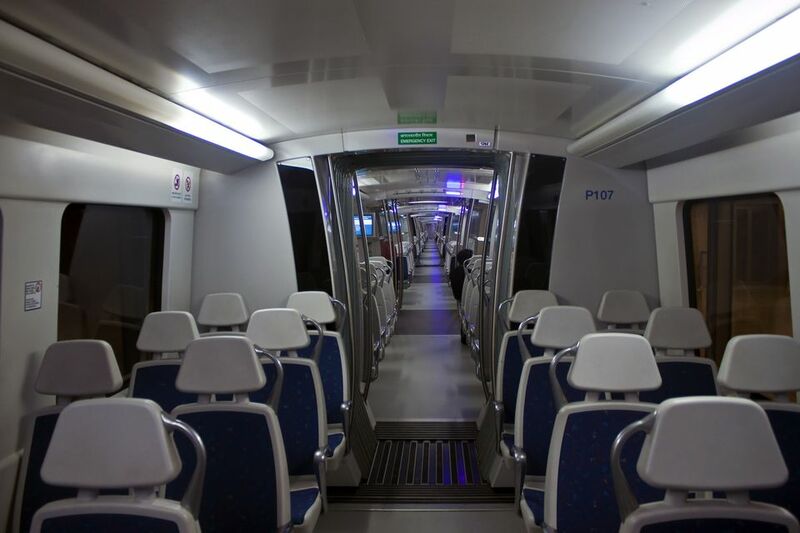 If your low-cost carrier flight arrives or departs from Terminal 1 and you wish to travel on the Delhi Metro Airport Express, there are a couple of options. Transfer buses operate between Terminal 1 and Terminal 3. Alternatively, there are also shuttle buses between the station at Delhi AeroCity and Terminal 1. The buses depart every 15 minutes from 6 a.m. to 11 p.m. The minimum fare is now 10 rupees. The fare from New Delhi Metro Station to Delhi Aerocity is 50 rupees, and 60 rupees to Terminal 3. A copy of the fare chart is available here. The frequency of trains is every 10 minutes during peak times (from 8 a.m. to 8 p.m.), and every 15 minutes during non-peak times. The check-in facility means that passengers will be able to travel baggage free on the Airport Metro Express, enabling two layers of security checks to be avoided. It has grown in popularity and about 500 passengers now use it every day. The checked-in baggage is transferred to Terminal 3 of the airport through a secure baggage handling system. Passengers can check in up to 12 hours before departure. Counters close two hours before departure. A new premium porter and indoor buggy service has been introduced at the Airport Metro Express Line's Terminal 3 station. The service is provided by Allways, a Hong Kong based company that's part of the Plaza Premium Group. It particularly aims to assist passengers who are carrying a lot of baggage and the elderly. The cost of the service is 300 rupees per porter.